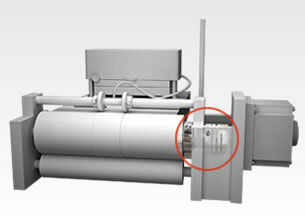 High speed printing machinery is almost always running at full speed, or close to it, so precise motion control is key. Even the most minute of shaft misalignments can lead to stacks of unusable products or worse—total equipment failure. Miki Pulley offers a range of high performance, high precision motion control solutions for printing equipment. In the example above, a Miki Pulley PSL shaft lock bushing and SFC precision coupling are used to control large rollers within a printing machine. The devices work in tandem to improve the equipment’s performance and efficiency while reducing wear and tear on its moving parts. The zero-backlash SFC shaft coupling utilizes metal plate springs to provide high torsional rigidity while dampening vibration. A flexible element gap also dampens conductive heat transfer from the motor to the output shaft. 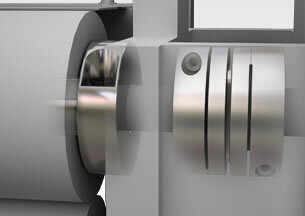 The PSL shaft lock bushing connects the shaft and hub using the wedging action of the PSL’s tapered surface. This positive locking device provides even radial surface pressure and higher torque value, and installs quickly and easily. Request a quote on precision shaft couplings, shaft lock bushings, and other motion control solutions for your printing equipment. Or, contact Miki Pulley to learn more.